I must be getting better. I did some sewing today. Last week I started cutting hearts out of felt. I even let Mat help me during Kade's piano lesson. I have been seeing felt garlands all over the internet in various shapes. 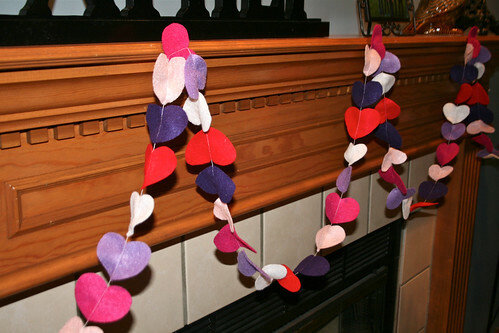 Here's my Valentine garland. I made a few of these and hung them around the house. Kade was glad I didn't put one in his room. Mickey's glad they won't be around forever. Mattey, who stayed home with a sore throat today, thought they were so cute. I think the sewing did me in. I'm exhausted. Guess I'm not totally recovered yet.